The preliminary results for OAEI have been generated and are available now (28.09.2014). Link to results page. The anatomy track in 2014 consists of the default task to match the two ontologies of the anatomy track with the standard configuration of your matching system. (2) However, finally you have to wrap your tool against the SEALS client provided via the OAEI main page and run this client against the Anatomy testsuite. 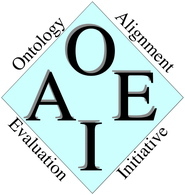 For this purpose, a tutorial is linked via the OAEI 2014 page. For running the Anatomy testsuite you will have to specify the following input parameters.